This Valentine's Day they are bringing back their special Sweethearts' Snack, a $35 per couple (plus tax and gratuity) prix fixe menu consisting of four heart-shaped sandwiches served with potato chips and carrot sticks, big glasses of fresh milk (plain or strawberry-flavored pink) with a heart-shaped straw for two. And for dessert? The PB & J Pretzel Sundae (vanilla ice cream, peanut butter pretzels, and raspberry sauce) and candy Conversation Hearts. After your meal you'll take home a jar of Peanut Butter & Co.'s peanut butter. Aw, fun! Lawman and I have spent many a date at PB & Co. I'm a fan of their Elvis sandwich. And who doesn't love a swirly straw? 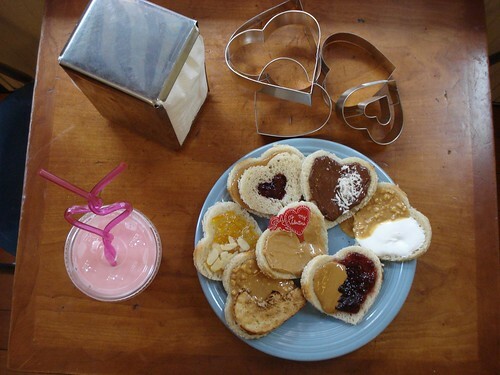 PB & Co. will be open from 11:00am until 9:00pm on Valentine's Day. This event's been really popular in the the past so reservations are suggested. You can guarantee seating by booking 45-minute time slots with a credit card. 240 Sullivan Street in NYC. What a fun place to celebrate Valentine's Day!! I am lucky enough to have my local grocery store sell their peanut butter...I was very happy to see it on the shelves!! It is really excellent!! It looks really nice!! !Happy Valentine’s Day !!! Happy Valentines! Thanks for the address because I really fell in love with the cutters! 56 W 22nd St, between 5th and 6th Avenue in the city has a pretty good selection of heart shaped cutters of all sizes. Their number is (212) 675-2253 and you can find them online at http://www.nycake.com/. Happy V-Day! wish i could find cookie cutters like that here in the UK!